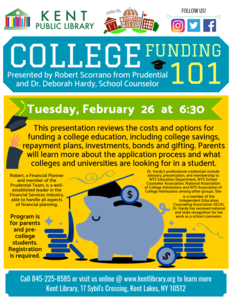 Rob Scorrano of Prudential and high school guidance counselor Dr. Deborah Hardy will offer a presentation about college funding on Tuesday, February 26 at 6:30pm at the Kent Library. This presentation for parents and pre-college students reviews the costs and options for funding a college education, including college savings, repayment plans, investments, bonds and gifting. Parents will learn more about the application process and what colleges and universities are looking for in a student. The Kent Library is located at 17 Sybil's Crossing off Route 52 and can be reached at (845) 225-8585 or www.kentlibrary.org.